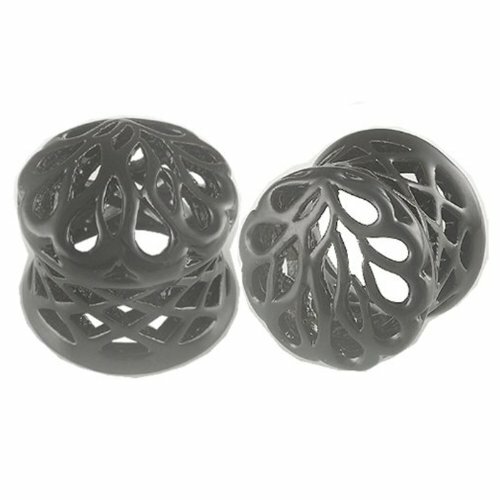 You are buying 2 Pieces (One Pair) of 1/2 Inch (12.0mm) Black Alloy Double Flare Earlet Ear plug tunnels. These tunnels are made of the Electric black powder coating alloy with nickel free and fits nicely in ear without having to wear "O" rings. The wearable size measured at the centre is 1/2 Inch or 12.0mm. All body jewelry is 100% guaranteed for craftsmanship and quality. You will receive pieces exactly as shown in the picture. All my body jewelry is delivered to you with beautiful jewelry pouch or box or gift box at no extra cost! TAKE ADVANTAGE OF BUYING AND GET THESE NOW WHILE THEY LAST!! REFINED & TASTEFUL - Ear size 1/2 inch gauges plugs flesh tunnel plugs look stylish dressed up or down, they're great gauge earrings size 12mm presents too. You won't find these 1/2 inch ear plugs anywhere else. NOT SMELLY - These ear gauges size 12mm stretcher expanders ear plug tunnels are woven which allows air to flow through so there is no smell. POLISHED BLACK - Highly polished, these classic ear 1/2 gauge plugs jewelry shine and look incredible. SLEEK SATIN POUCH - These polished black size 12mm ear gauges eyelets are delivered in a free gift box or a chic pouch so you can keep them protected when not being worn. WHAT WILL BE DELIVERED? - A PAIR of 1/2 inch gauges black alloy tunnels. If you have any questions about this product by bodyjewellery, contact us by completing and submitting the form below. If you are looking for a specif part number, please include it with your message.